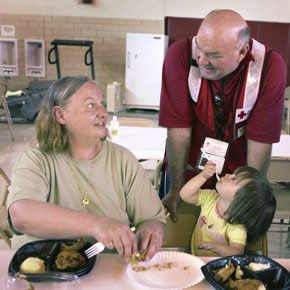 Within hours of when disaster strikes the Red Cross is there, providing meals and safe shelters. While families are struggling to rebuild their lives, Red Cross volunteers provide meals that will keep them strong and give them much-needed energy for the challenging days ahead. You can help stock our feeding trucks and kitchens this holiday season and make sure no child or family goes hungry when disaster strikes. For $100 dollars you can help deliver a hot meal to 10 people, for $50 you can feed 5 people and for $20 you can feed 2 people. This gift can be found in the Holiday Giving Catalog in print and online.